German aerospace research institution Bauhaus Luftfahrt have released details of its concept for a zero-emissions 190-seat aircraft which could potentially enter service in 2035. 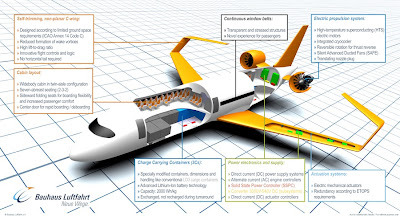 Designated the Ce-Liner, the electric aircraft would rely on twin super-conducting electric motors supplied by a bank of up to 16 battery containers. 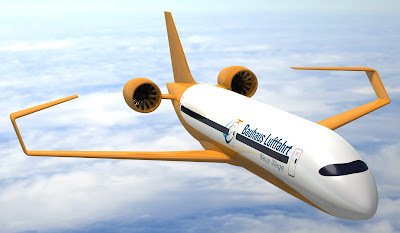 Bauhaus Luftfahrt says forecasts on battery technology suggest a 600 nautical miles (1,110km) range should be achievable by 2030 but would cover only 59% of routes in the 180- to 200-seat sector - the category identified as having the largest potential emissions-abatement effects. By 2035, it states, the technology would allow a range increase to 900 nautical miles, raising the coverage to 79%. If the introduction was pushed back further to 2040, the range could even extend to 1,400 nautical miles. The aircraft's configuration improves aerodynamic efficiency through a non-planar "C-wing", increasing performance without compromising wingspan limitations. Bauhaus says the design goes "far beyond" current all-electric flight concepts. "Recharging the batteries during turnaround is postulated to remain challenging, hence an exchange after each flight is assumed," it adds. The Ce-Liner will utilise so-called High Temperature Super-conducting electric motors. These are very much in the experimental phase. These motors are well suited to aerospace application because they are expected to exhibit very good power-to-weight ratios. The Silent Advanced Fans utilising Electrical power (SAFE) propulsion devices of the Ce-Liner need a total of around 60,000 hp in order to take off. Bauhaus Luftfahrt's future concepts have also included the Claire Liner, a clean-air box-wing aircraft design, and extreme short take-off capability using laminar airflow and integrated wing fans. This year, aeronautical testing organisation IABG joined Bauhaus Luftfahrt's original partners, EADS, Liebherr Aerospace, MTU Aero Engines and the Bavarian economics ministry.